China's foreign exchange reserves shrank by $180 billion in the third quarter－the largest fall in two decades－following the central bank's move to hold the yuan's value through selling US dollars. However, the reserves fell by $43 billion in September after an unprecedented drop of $94 billion in August, suggesting that depreciation pressure on the yuan is easing. 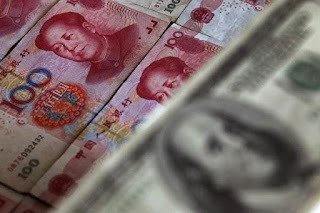 The figures, released by the People's Bank of China on Wednesday, also showed that by the end of last month the foreign exchange reserves stood at $3.51 trillion－still the world's largest. Declines in the reserves in recent months have sparked fears among investors about their sufficiency, liquidity and usability. Another question being raised is whether the squeezed reserves can cover the nation's foreign debt. Recent research by UBS AG estimated that more than $2.2 trillion of the $3.5 trillion reserves were held in developed countries' government bonds, with about $1.4 trillion in US treasuries. The foreign exchange reserves are four times the external debt amount and can cover 20 months of imported goods and services, according to the research. Tom Orlik, an economist at Bloomberg, said, "A slower foreign exchange drop eases fears about extreme selling pressure on the yuan." The currency's value stabilized last month after the biggest tumble in two decades following the People's Bank of China's adjustment of the yuan's daily exchange reference rate against the US dollar on Aug 11. The yuan rose by 0.3 percent last month against the dollar compared with a fall of 2.6 percent in August, according to the Shanghai-based China Foreign Exchange Trade System. President Xi Jinping committed to the yuan's stability during his state visit to the United States last month. Premier Li Keqiang has also reiterated on various occasions that there will be no foundation for a further depreciation of the currency. These were signs that at least in the short term the depreciation pressure on the currency had been impaired, Orlik said. It also means the leaders are prepared to defend the currency at its present level for a while longer, and the total amount of the foreign exchange reserves will continue to decline, he added. Economists said depreciation pressure on the yuan would remain as long as there was a possibility that the US Federal Reserve would raise interest rates in the near term.